For the last four years, Facebook has been the number one social network website in the entire world. 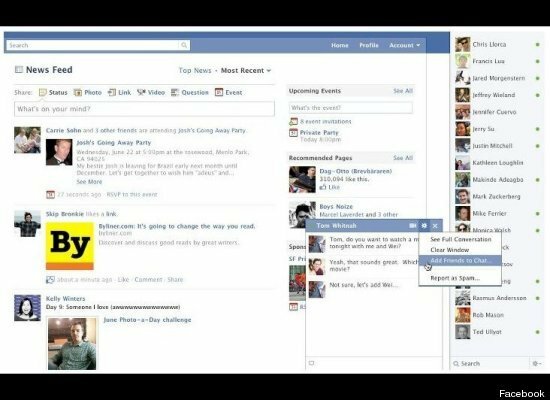 After quickly taking over the top spot from MySpace, many saw Facebook as the perfect format for social networking. But Facebook kept making tweaks. It seems that every few months Facebook makes a few minor changes. And then every now and again, Facebook goes into a major revamp and overhauls much of the format. And this weekend, Facebook made another big change. This time the feature to be revamped was Facebook chat. Now, Facebook chat is going to feature group chatting and video chat as well. In addition, the look of the chat menu has been redone. For group chatting, users are already reportedly using the new option. According to Facebook officials, about half of all users have already tried the feature. Friends can now discuss topics and plans with everyone involved at once rather than going from one friend to the other to coordinate plans. For the chat design changes, now as the size of the browser a user has is made larger or smaller, the chat feature changes accordingly. The new design also makes it easier to begin chats, as only one click is needed now. The biggest change to the chat option is the inclusion of video chat. Facebook worked with Skype to put the option together for users. Users can start a video chat with the click of a button or even make video messages to friends when they are not online. This allows friends to talk face to face to speed up conversations when time is a matter and to make instant message conversations more intimate and meaningful. Now with over 750 million people from all over the world using Facebook on a daily basis, it is easy to say that Facebook has reached levels that MySpace only dreamed of. The new features are already proving to be wildly popular and are surely going to take Facebook to new heights. Sadly the facebook chat lost it’s scrollbar and offline friends were on the list in that sidebar. Doesn’t really make any sense though. They dropped the ball on this one… there’s no good way to spin it. I really don’t see users warming up to this new feature at all. They dropped the ball at a horrible time (with Google Plus picking up steam).